Bessacarr Publications: Look at Guides - Home Page. Do you want your visitors to understand and appreciate your heritage? Do you want more visitors to come back again? Your heritage is unique. Our skill is interpreting what you want, the way you want it to be understood. Our print publications include the successful "Look At" guides, full colour guides extending to audio guides and interpretation panels. These have the same successful formula as our Clasic Look at Guides but are printed in full colour, incorporating both photographs and illustrations. This series of over 350 classic guides covers heritage sites across Britain and beyond, including churches and cathedrals, towns and villages, museums,historic houses - and even an oil terminal! They are ideal walkaround companions, because their clear styling and illustrations enhance and inform the visitor experience at the time, rather than simply being a souvenir to take away. They are designed to stimulate interest in buildings, their contents, and the thinking or beliefs reflected in their construction. Examples: Look At Chatsworth House, Look At Eyam. Our audio guides are easy to use and give another dimension to your visitors’ experience. 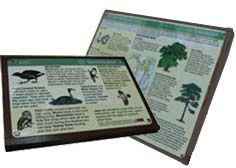 They are particularly effective when used with our walkaround guides or interpretation boards. Available in a number of formats suitable for podcasts, audio downloads, pre installation onto an audio device, or mobile phones.